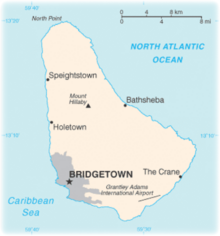 Barbados contains a healthy selection of diving opportunities from barrier reefs with large coral heads to the fringes and patch reefs that are found closer to shore to the wrecks that have given Barbados the name of one of the best wreck diving sites in the world. » The SS Stavronikita (west), a 365ft Greek freighter that was sunk to form an artificial reef. It is now home to numerous fish and corals. The Stavronikita lies in 120ft of water with the stern at 100ft and the bow at 70ft. » Friars Crag (southwest), a 100ft Dutch freighter that was sunk in 1984 and lies in 55ft of water. A fantastic reef is also located nearby. » Carlisle Bay (southwest), this historic bay is the site of numerous wrecks and is therefore an ideal dive location. There are four wrecks which are of particular interest - the Berwyn (World War I French tug, 50ft long, sunk in 1919), Eilon (drug running vessel, sunk 1996), Ce-Trek (a Barbados-based fishing boat, 45ft long was sunk just south of the 'Berwyn' in 40 ft of water) and Fox (a small wreck - possible to see on same dive as Ce-Trek). This dive is ideally suited for beginners. » Pamir (northwest), this wreck is 165ft long and 60 ft deep and offers a relaxing dive. » Bell Buoy (southwest), a dome-shaped reef varying from 20-60ft, popular for its brown coral forests, sloping corals and schools of fish. 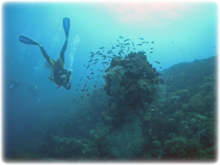 You can see several coral environments, making Bell Buoy an educational and exhilarating experience. » Shark Bank (southwest), a coral reef reaching depths of 135-145ft. 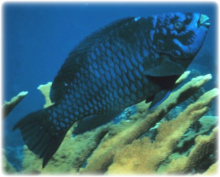 Look out here for sea turtles and parrotfish. 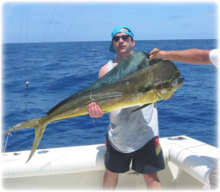 Well known for its flying fish, Barbados also offers the fisherman an opportunity to catch a marlin and other larger catches, like the tuna, wahoo, dolphinfish (mahi mahi), sailfish, barracuda, as well as shark. Certain fishes are more predominant at certain times of the year, so it is best to check with a Barbados fishing source if you are looking to catch a specific type. For the marlin, for example, best to head to Barbados between February and April, after that they become quite a rare catch. The fishing season runs from December to April when all species are readily available. Some fish are available year round, like the wahoo, barracuda and shark. You can charter your own boat or join a trip that is already going out, where you will get lessons and tips from the crew. Look for purpose built boats with facilities to accommodate your party, if some aren't interested in fishing, make sure they have space to sunbathe and relax. Most charter companies offer all-inclusive packages including food, drinks, bait and tackle.